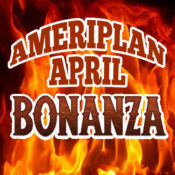 AmeriPlan April Electronic Bonanza Promotion Has Been EXTENDED! AmeriPlan’s BIGGEST Promotion has been EXTENDED UNTIL MAY 7th at 5pm! YOU ALSO GET DOUBLE POINTS TOO! For those of you who did your one piece of business in March and qualified for the April Electronic Bonanza, Congratulations… here it is! 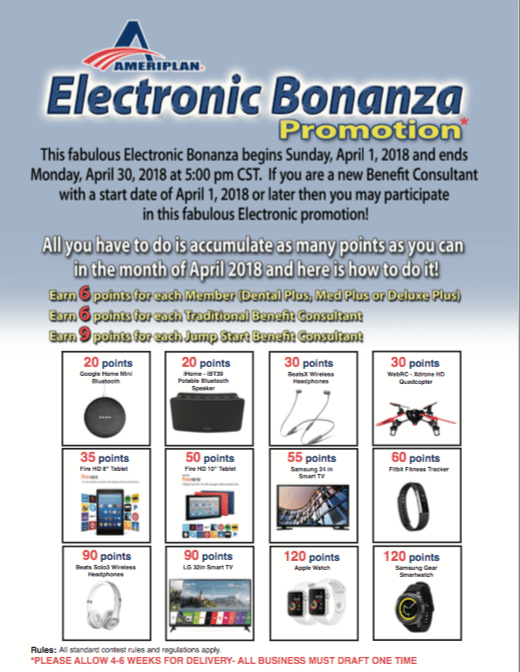 This fabulous Electronic Bonanza begins Saturday, April 1, 2018 and now ends Monday, May 7th, 2018 at 5:00 pm CST. Check with BC Support for any questions you may have! All you have to do is accumulate as many points as you can in the month of April 2018 and here is how to do it! WOW! I’m Excited About This Awesome Promotion!! Thank You Ameriplan! Pretty awesome and exciting promotion. Way to go Dennis & Daniel! Is there anyway to post flyers in a text format for those who are visually impaired or blind? I am using a screen reader for accessibility and need access to this information. Text format is required for the screen reader to read it to me, as opposed to, PDF or image files. The screen reader does not read pictures or images. We have a large percentage of Hispanic residents in our area and I do not know how to speak with them about being a benefit consultant, I need brochures for the Spanish residents? please comply. One started to sign up and my communication skills was not enough to explain how you get paid. I thank you for your understanding, how to email them and get a response that way as well, need to help my team as well. 913-228-9336 or575-6102 citizeny2002@yahoo.comemail no.